Impact resistant PC shell and high density EPS foam double insurance to guarantee the safety of kids during cycling, skateboard and riding. Cute 3D image is attractive to kids, an exact holiday gift for kids. Double Security: PC shell is impact resistant and high-density EPS foam is for great buffer action, which ensure safety of kids during sports. Breathable: 9 air vents exhaust hot air to keep head cool and comfortable. Lightweight: Only 7.7oz, super lightweight, no extra weight on head for free sports. Convenient: Adjustable strap with quick release buckle for easy on/off. Detachable: Absorbent lining, sweat-absorbent and soft, you can take it down to clean up. 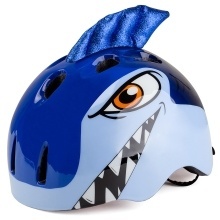 Designed for Kids: Practical for cycling, riding and skateboard, and cute 3D image design attractive for kids, cute holiday gift for them.